Track & Field Records for Every State Meet in the U.S. Even as the snow is falling and winter still grips the country, it’s time to starting shifting focus to the upcoming outdoor track season. As the season begins approaching the starting blocks, it’s now the time for athletes and coaches to start setting goals and looking forward to the potential of breaking new records. To help with your goal setting, we thought it would be helpful to gather the top high school track records from each state meet. Below is a collection of track records organized by state. Some lists include just the 2018 records, while others include the best all-time track & field records. There are a few discrepancies between lists that included FAT times and those that did not. We compiled lists that provided the most consistency available. Hopefully this collection of records will help you and your athletes understand the performance of the top performers lies, and in turn help you decide where to set your goals for the season. 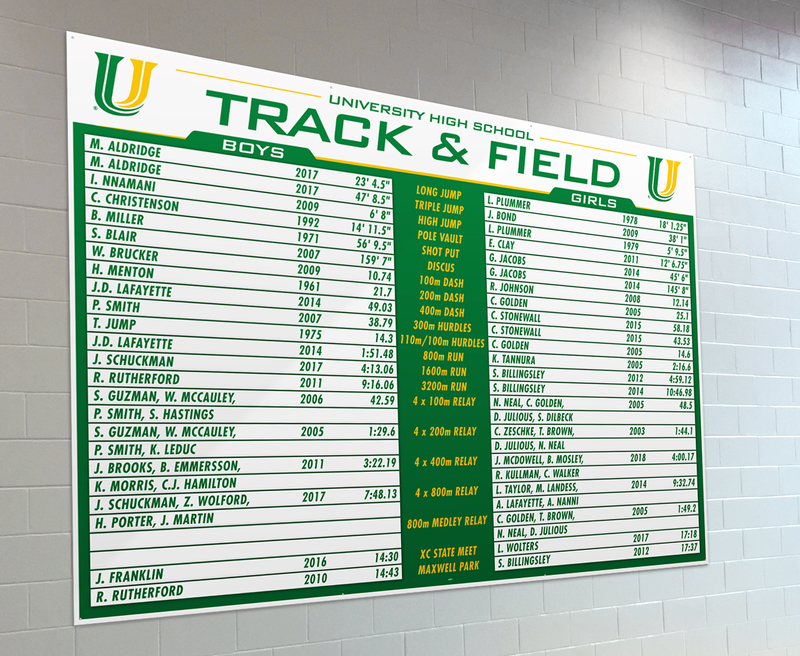 Team Fitz Graphics produces track and field record boards for programs nationwide. With thousands of record boards displayed around the country, we have the experience to produce a great looking record board for your program. Give us a call today or submit our contact form to speak with one of our reps. They would be happy to get the conversation started and provide you with a free design and quote.